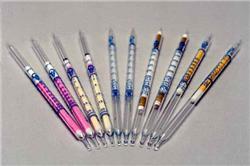 Gastec 72P Ethyl Mercaptan (Inline Sampling Tube) Detector Tubes. Detection Range: 2.5-30 ppm. 10 measuring tubes per box.